Home » Gold » Gold Schemes by Government – Good for Investment? Today is dhanteras and you must be planning to buy Gold. Well, this dhanteras is somewhat special as you have option to buy gold in paper form also. Yes, I am talking about Gold Schemes which are launched recently by Prime Minister Narendra Modi. Name of this schemes are (1) Gold Monetisation Scheme (2) Sovereign Gold Bonds and (3) Indian Gold Coin scheme. Gold Monetisation scheme is also known as GMS. GMS allows an individual to deposit the gold with the bank. Bank will be paying interest on the deposited gold. This is very good way to convert unproductive asset gold in to production asset. The Sovereign Gold Bond Scheme is also known as SGBS. Under SGBS, gold bond will be issued to investors in paper or demat form. 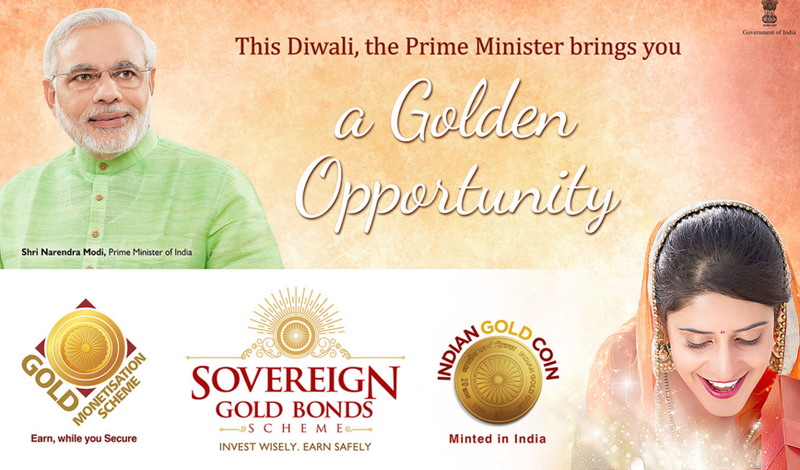 The return on these gold bonds will be directly linked to gold price. Also Read – MCX Gold Option – How it works? As a part of Gold scheme new gold coin with National Emblem of Ashok Chakra on one side and Mahatama Gandhi on another side will be available to Investor. This gold coin will be available in 5 gm and 10 gm denomination. These coins will be distributed through designated and recognized MMTC outlets. Before making an investment in these schemes let’s compare features of these schemes. Recent Gold Scheme launched by the government of India is a welcome step. This scheme will be defiantly beneficial to the investor as well as economy of country. Gold will become a productive asset as it will generate interest up to 2.75%. Gold scheme will be an additional alternative to purchase gold. The Investor need not to worry about physical security and storage of gold. 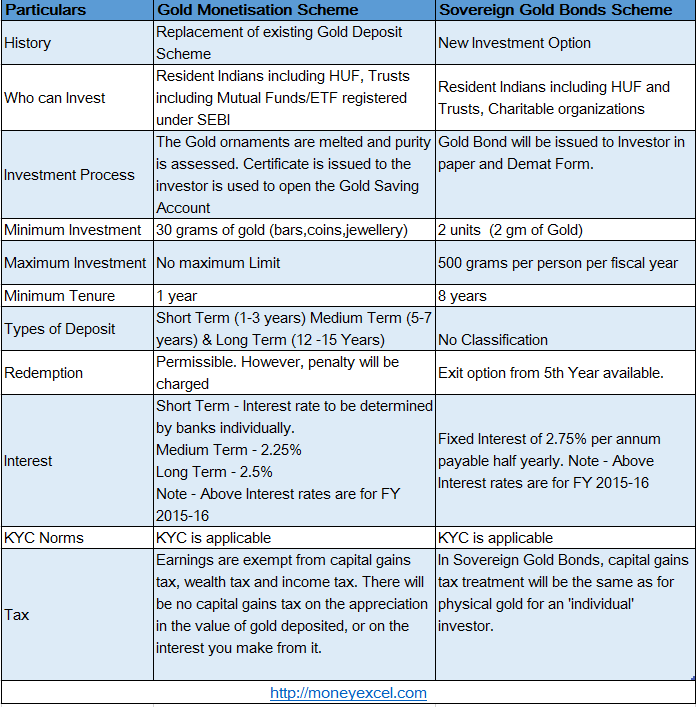 Tax Benefits applicable to gold monetisation scheme. An investor can convert gold into cash using this channel. Gold import is expected to reduce. Foreign currency reserve will be saved. It will boost the economy. The banks will be able to raise loan using this gold as a security in the foreign market. This gold can be sold to generate foreign currency and it will increase foreign reserve. Gold Monetisation and Sovereign Gold Bonds Scheme are good scheme for investment and defiantly help investors. However, your portfolio should not exceed 10% of the gold investment. If you have already invested 10% in gold you should not buy gold. As per my view trading in Gold is better than Gold Bonds. Bonds gives only 2.75% of interest we can get more than that by gold trading. Gold trading didn’t have certain time bound as gold bonds have we can gain immediate returns when ever we want by trading. I trade in Gold by taking the service from #SquareIndia Advisory Pvt Ltd which helped me to get better returns what ever the market conditions may be. This only happened by their experience and brief analysis. They also provided me with Live and Local Bullion Rates. So, i would like to suggest #SquareIndia Advisory Pvt Ltd to gain better returns, i’m sure you will not be regretted for your decision .